Patricia has been helping our daughter out with handwriting and maths. She is warm, patient and good at communicating, and she has really made a difference. Thank you, Patricia. Patricia started tutoring my two daughters this year and they have both grown in confidence as a result. She has a lot of patience and clever techniques which focus on the child’s strengths and helps plugs gaps. 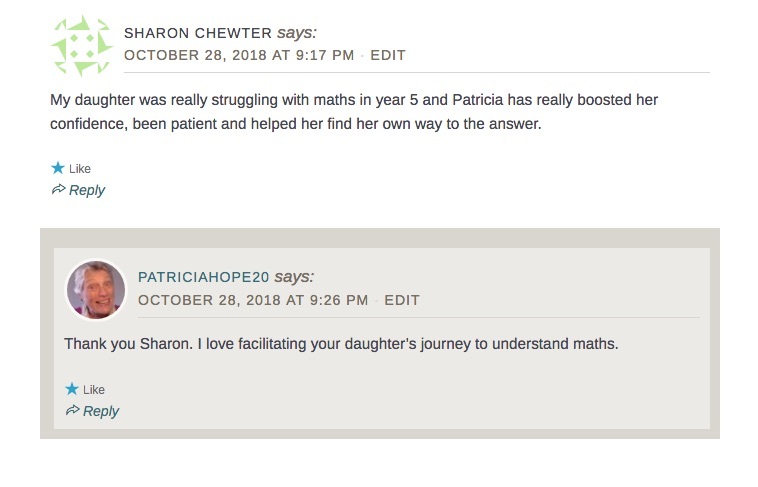 My daughter was really struggling with Maths in Year 5 and Patricia has really boosted her confidence, been patient and helped her find her own way to answer. 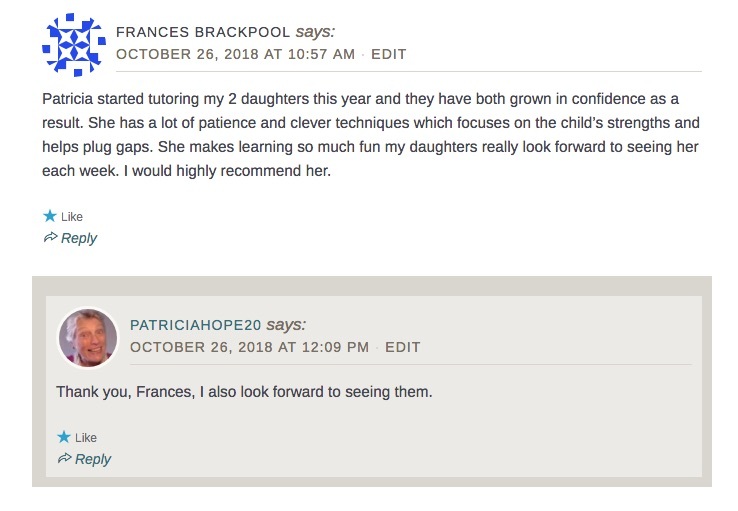 Patricia’s calm, unique approach has helped my daughter massively. The sessions are enjoyable and fun whilst being informative at the same time. We can already see a huge improvement in a small amount of time. Patricia is very passionate but has a lovely kind temperament that really understands exactly what my daughter needs. We are thrilled to have Patricia on board to help my daughter whose confidence was rock bottom but is steadily improving. Plus Patricia is really getting to the bottom of my daughter’s dyslexia and de-coding it in a way that we all understand. He Even Enjoys Writing Now! Patricia has been tutoring our 10 year old son for several months now and wow what a difference. We just received his school report and he has gone up 2 groups in Maths and 1 in English. He has gained much more confidence in himself and even enjoys writing! That is quite something. Patricia makes lessons fun and when he gets a little distracted she changes tack, it’s even been seen to get the nerf guns out whilst practising times tables! We would recommend Patricia without hesitation. Patricia has provided excellent tuition and support for my 7yr old son. He has made great progress and has gained confidence through his learning. She has understood and applied learning techniques that suit my son’s needs. Her use of Brain Gym and aroma oils have shown positive results. 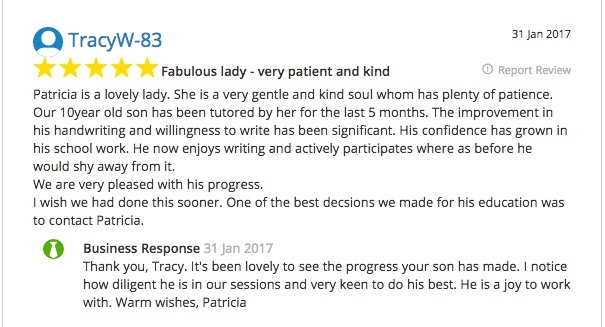 Patricia has been tutoring our 6-year-old son for a year now and the difference in his confidence and progress has been amazing. He is a summer baby and really was not ready for school and really struggled. He has now with the help and support of patient motivation and starting from scratch, made huge steps in his reading and writing and loves his sessions with Patricia. Best Decision We Made was to Contact Patricia. Patricia is a lovely lady. She is a very gentle and kind soul who has plenty of patience. Our 10-year-old son has been tutored by her for the last 5 months. The improvement in his handwriting and willingness to write has been significant, His confidence has grown in his school work. He now enjoys writing and actively participates whereas before he would shy away from it. We are very pleased with his progress. I wish I had done this sooner. One of the best decisions we made for his education was to contact Patricia. 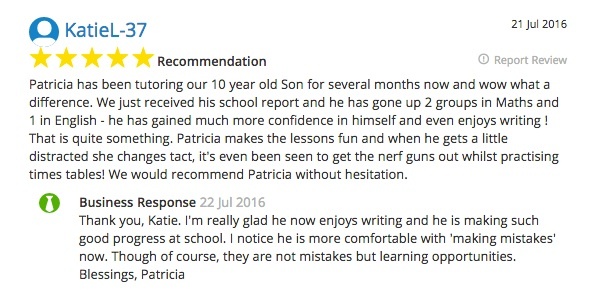 Patricia helped my 8-year-old son who needed a boost of confidence in his Maths and English. Patricia helped him with his weekly spellings and phonics. His spelling test results dramatically improved and the teachers at school recently gave him an excellent school report and he is now in the top groups for Maths and English. Patricia made the lessons fun and engaging and my son enjoyed her company. I highly recommend Patricia to other families. 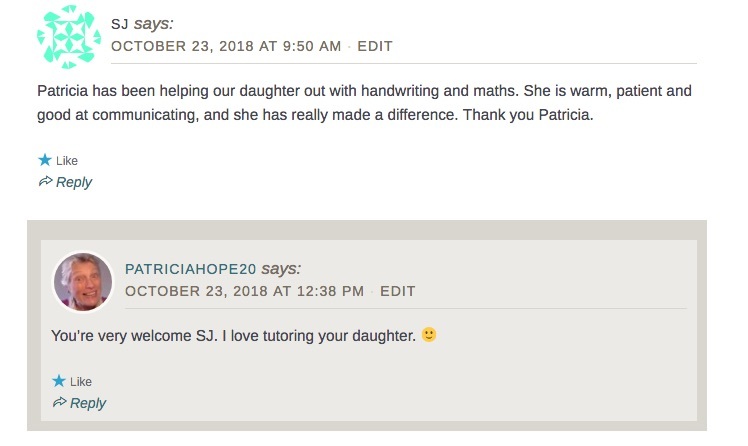 Patricia is a really excellent tutor. She is caring and empathetic with a wealth of knowledge of practical approaches one can use with children who are struggling with maths. My little girl is making real progress at school and with her confidence thanks to Patricia’s tuition. I am very pleased. Patricia is also very reliable and quick to respond to any queries.